A coalition of 18 Democratic attorneys general are suing Secretary of Education Betsy DeVos for the second time over her plan to end an Obama-era regulation that protects student loan borrowers from predatory career-training programs. The rule, “gainful employment” was created to protect students from exploitation and fraud by cutting off federal funding to vocational programs that saddle students with more debt than they can afford to pay back. DeVos halted enforcement of the gainful employment rule, effectively allowing schools to avoid disclosing this information. The Department of Education is currently working on rewriting the rule entirely. 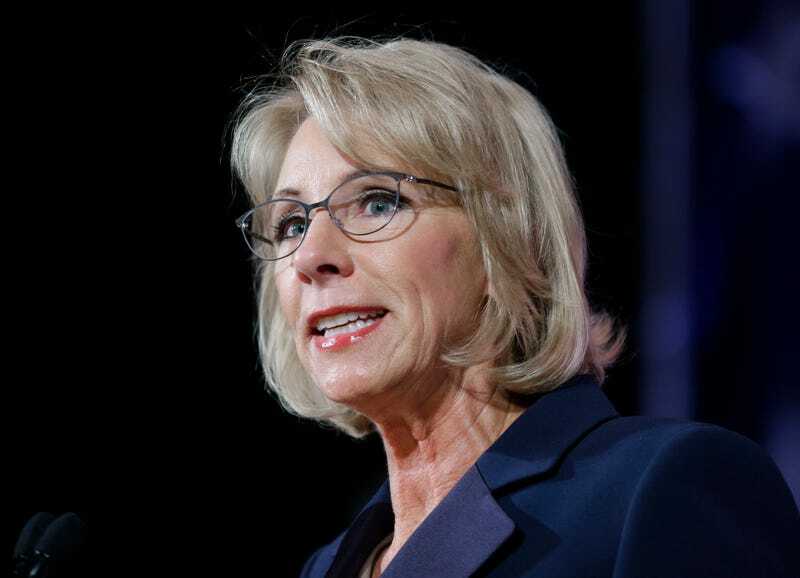 The suit, filed Tuesday by 17 states and the District of Columbia, alleges that DeVos is breaking the law by refusing to enforce the gainful employment rule, which has been upheld multiple times by federal courts after for-profit institutions challenged the regulation. Many education advocates suspected DeVos would champion the interests of for-profit colleges, and they’ve yet to be proven wrong. In September, DeVos had the gall to appoint one of DeVry University’s former deans to run an anti-fraud unit in the Department of Education. In 2016, DeVry agreed to a $100 million settlement with the Federal Trade Commission because of years of cooking their graduates’ employment stats (As Slate reported, DeVry counted grads serving food at the Cheesecake Factory as working “in their field”). That’s pretty much like asking Harvey Weinstein to run a sexual harassment task force. Unless the courts intervene, DeVos will continue to leave graduates vulnerable to fraud. The same attorneys general who filed Tuesday’s suit are also suing DeVos over her refusal to enforce the borrower defense rule—another Obama-era regulation. That rule sets up a process that allows students who claim they were defrauded by for-profit institutions to apply for loan forgiveness. According to BuzzFeed, not only did DeVos tell a group of Republican leaders that the rule offered “free money” to any student that “raised his or her hands”—the DOE has yet to approve a single claim by a defrauded student. Like the Cheeto-dusted dotard that put her in charge, DeVos’ has attacked Obama-era protections with the single-mindedness of a wrecking ball. If she succeeds in undoing the regulations, it will have a disproportionate impact on black graduates. Black grads incur much higher student loan debt than their non-black peers, and data shows that predatory for-profit institutions are largely to blame. A study reported by the Atlantic found that black graduates have nearly double the loan debt of white grads four years after graduation—despite having similar amounts of debt at the moment they receive their diplomas. While factors like employment discrimination and defaults are partially to blame, researchers found that graduate school discrepancies contributed the most to that yawning debt gap. Not only were black grads more likely to continue their studies, 28% of them enrolled in a for-profit school, while less than 10% of white grads did so.